The LH is now listed as the strongest submersible pump in the global market leader's European supply range. It scores top points with a maximum head of 216 m. This means it pumps from the base to above the platform on Berlin's television tower. Tsurumi's new flagship is a prominent sight with a dry weight of 1.3 tonnes and a 1.8 m construction height. The powerhouse, with its 110 KW motor, is used in applications where large distances have to be covered. The water is allowed to contain sediments with up to 8 mm particle diameter. This means that one pump is enough in places where several used to be needed. The new KRSU822 turns up the power even more if a really "thick liquid" needs to be pumped: after all, the clear passage of 56 mm makes it the medium of choice for applications with heavy media such as sludge, sandy water or bentonite. 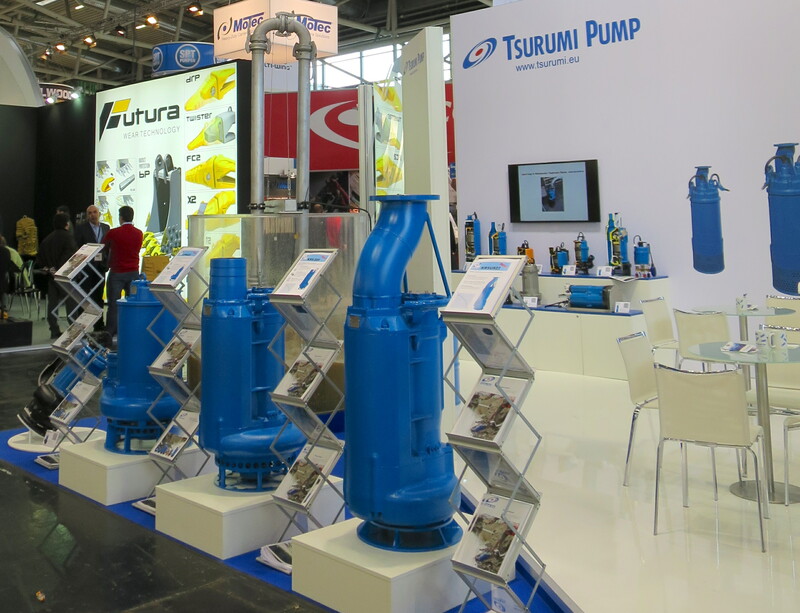 According to Tsurumi, there have been numerous improvements to the rest of the product range, which includes around 250 pump models for industrial water, drainage water and sewage. The heavy duty pump series GPN with the 22 KW motor and spiral casing is now also available with 4 inch outlets and the 18 KW-KRS with agitator with a 8 inch discharge. The live demonstration of the permanently running pumps in the water tank turned out to be a visitor magnet. Tsurumi is taking things in its stride: thanks to the special design features that are only available from Tsurumi, the pumps offer specialists comparatively long durability, even in the snore and dry run mode. Find out more by visiting Tsurumi.eu on the Internet.